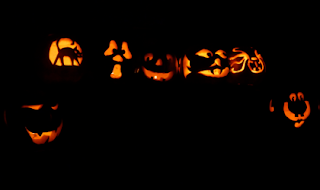 Tonight Emily and I invited friends over to carve up some pumpkins for Halloween. Chris, Kelly, Aaron, Cassie, and Garrett came over to carve up some pumpkin faces! When Chris got to our place we quickly realized that we didn’t have the proper knives or scooping utensils. Chris decided to run over to Freddy’s to pick up some pumpkin knives and while gone Garrett and Cassie showed up with everything we needed including a book of pumpkin face cutouts that we used for our pumpkins. I popped in the movie “Pineapple Express” while we carved up our masterpieces. As you can see from the photo above they all came out great.. especially the cat that Chris made on the left in the photo. Mine is on the far right and I think I did a horrible job. Emily’s is to the right of the cat and looks great. Cassie’s octopus is above mine on the right. Great job everyone.. too bad Emily and I covered the pumpkin seeds with so much salt when we baked them! Whoops!